Informative thread this one, and hats off to igrf for putting up the video. The space to leeward thing always gets me, how do you defend it? Just when I think I've got a nice bit of room to accelerate into, somebody pops into it, forces me up and I get spat out the back. Any suggestions what I should be doing? I found the Shirley Robertson video particularly helpful. Ref. The gap I think it depends on how competitive the start is, but you can try and make the space look uninviting by filling the space, heading down, easing the boom and so forth so the port tacker ignores your space. This is rarely a problem at a club race and certainly was not an issue for Graeme's start. I am pretty hopeless at it at championships, I think that I am the marshmallow, since there always seems to be a hotshot to windward! When it's light, I can get right forward, but it was winter wind puffy up on my ear now and again, he the Youf a third of my age and probably a third more weight can get forward and still control any puffs, me, need to be at the wide point of the boat which is too far back, which is why I'm sat back there, not an excuse, a reason, I know you're supposed to be forward and the head in the boat bit was getting my plate back down. I'm also an advocate of getting the transom out in light airs but I've been told the Blaze doesn't like too much of the bow buried either. If it's more medium then you have to be on the racks so can only get so far forward but that doesn't seem to be too much of an issue as if you're sitting out on the Blaze there's enough power to get things going. , pumping the tiller to push the stern one way of the other (but read the rules, it's not allowed to cross the centre-line as you shake it for instance and also you have no rights if going backwards). 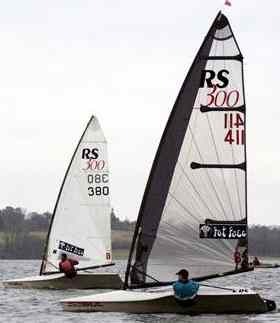 I'm just learning the current RRS as I've been out of serious racing for 10 years and for the previous 30 raced windsurfers (where, relatively speaking, I was the rules guru at my club). The tiller crossing the centreline thing is a rule of thumb used by most jury boats at big events. If they see a rudder blade flicking both sides it suggests that the boat is not trying to steer because flicking both sides would not achieve this. As for protecting your space to leeward, this is mostly done by rotating your bow down to a beam reach, without moving forwards. Mostly done using jabs on the tiller and big body weight movements. Once the boat has decided that they don't want to steal your space, or has reacted by setting up to leeward of your space then you can rotate the boat back to close hauled and you instantly have a one boat length gap, which is enough. In this case you should be close enough to the line that the leeward boat cannot spit you out the back without being ocs themselves. Thanks, interesting stuff, racing windsurfers with pumping allowed sitting on the line until just before the gun was the usual tactic, loads of PLF and you could hit warp speed in a couple of board lengths but back in the day when I was racing OKs and Herons the plan was to hit the line at full speed, close hauled and exactly on the gun. This was recommended by several of the pundits with various methods suggested to achieve it. (e.g. with 20 secs to go sailing away from the line for 8 seconds turning and making your final run). Hitting the line at speed is probably still the fastest way to start but is definitely a high risk strategy and not really an option on a crowded start line. As a small, light, person I'd suggest getting the trim right even if it means you lose some righting moment is the way to go. It's probably faster and will give you more options on pointing high or low. When you move back to a wider section of boat to generate some extra righting moment (probably not much extra, but I'm happy to be corrected) the transom will create more drag which means you need to sail lower to generate the power to offset the extra drag, sort of a vicious circle which will stop you having the option to point high. I don't know you, but with my limited experience of windsurfing there is little to no on the water rig control so you might be behind the curve here. Getting some pointers, or crewing/helming on a 2 person boat with someone who knows how to adjust a rig around the course could be helpful? Yes, there's no proper course before the start so if you see someone approaching from behind then bear off into the gap you've created and they will normally look elsewhere. You may need to work to open up the gap again afterwards but it's preferable to it being completely filled by someone else. Also, don't make your gap to leeward too big too early or you're asking for someone to steal it. My standard starting technique is to approach on port tack and tack under a starboard tacker and steal their gap! Windsurf course racers (Raceboards, Formula Windsurfing, slalom etc) have used a comprehensive set of rig controls since pretty much the beginning so I'm sure GRF has plenty of experience that way. A windsurf rig has two main controls, outhaul and downhaul (which is the equivalent of a dinghy Cunningham). They work in much the same way too, the downhaul bends the mast and loosens the leech and the outhaul flattens the sail. The difference is that you can't adjust these controls on the fly like you can with a dinghy.